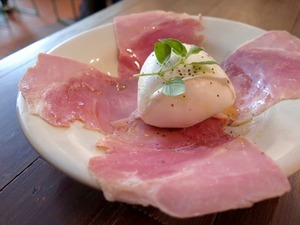 Prosciutto cotto e bufala. All photos: © tablehopper.com. The front seating area, with a communal table and vintage Indonesian school chairs. 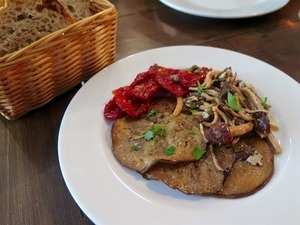 A selection of sott’oli (eggplant, oven-dried tomatoes, mushrooms). The quadraro (note this was one of the earlier pinsas—the crust is bubblier now). 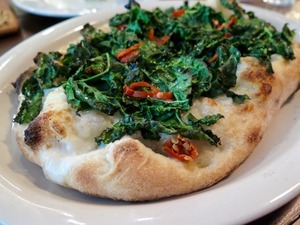 The namesake Montesacro pinsa, with straciatella, kale, peperoncini, and garum. 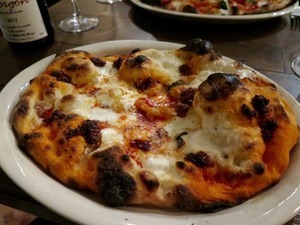 The infernetto pinsa, with ‘nduja and smoked buffalo mozzarella. 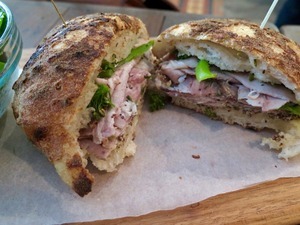 The porchetta panino at lunch, made with a pinsa bun. Anyone who has traveled to Italy, lived there, dated an Italian…any of it or all of it, Italy gets under your skin. The fresh ingredients, the old buildings, the natural beauty everywhere, the lightly chilled and acidic red wines, the handsome men, the warmth. 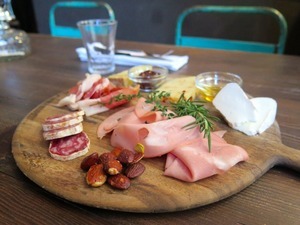 And oh yes, the salumi. 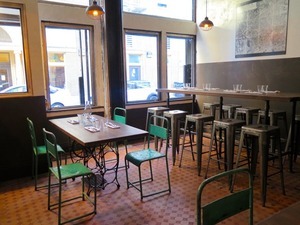 Anyone I know who has even a lukewarm feeling about Italy, I feel it necessary to tell them about ~MONTESACRO~, a newly opened enoteca named after a hardscrabble neighborhood in Rome. But I also tell them the caveats: you will have to go to the corner of crack and whack—one of the harder, sadder, grittier blocks in the city that is right along the border between SoMa and teetering into the Tenderloin—walk down the alley behind Dottie’s, and then you step into a Roman-inspired oasis. The place feels like such a discovery. And it is. The 100-year old history as a bakery, the old tiled floors, the brick walls, the tables and brightly colored vintage chairs, the smell of bread and dough, and then the masterpiece: the baking oven from 1913 or so, sadly no longer in use, but lit up and honored, lending an air of gravitas and presence to the room, an anchor to the past. Gianluca Legrottaglie of nearby 54 Mint, a Roman, has created a “pinseria romana” (more on that in a sec) and enoteca, one that is unflinchingly Italian, and probably the only nod to California is the kale salad (made with an anchovy vinaigrette and boquerones; $10). The menu is full of antipasti, from the vegetables cured in olive oil, garlic, and chile for a few weeks (make sure to get the mushrooms), to the cutting boards of salumi or cheese or both, like the extraordinarily simple but delicious prosciutto cotto e bufala ($14), with petals of cooked ham and a knob of buffalo mozzarella in the middle. But Legrottaglie is no jingoist—he admits the mozzarella made by LA’s Angelo & Franco is sweeter and tastes better than what he can import. The main event, the thing you were smelling before you even walked in, is the pinsa they make here. 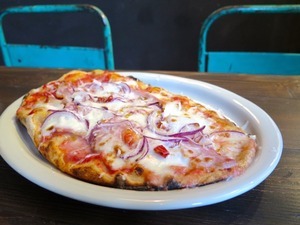 It’s not a pizza: the dough is made from a flour mixture of soy, rice, and wheat that comes from Italy, an homage to an ancient style of flatbread that was once made outside the walls of Rome. It’s crisp, nutty, and reportedly easier to digest, with an enduring flavor that makes you savor it differently (pizzaioli Claudio Gaetani and Alessandro Delle Rose ferment the dough for 72 hours, and bake it in an electric Cuppone oven for 90 seconds). 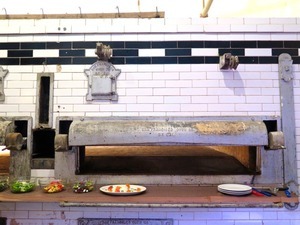 This is the first place in the U.S. to serve pinsa; you can read more about it here and here. The infernetto (smoked buffalo mozzarella, ‘nduja; $17) spoke to my half-Calabrese, spice-loving heart, but the quadraro (tomato, red onion, pancetta, pecorino; $17) is close enough to pasta all’amatriciana that it may be my favorite. Get a couple and share—easy to do with the individual pizza wheel each pinsa is presented with. Lunchtime means you should also look into the porchetta panino ($14)—the meat is so thinly sliced, with its richness kept in check by the housemade mustard and broccolini, all tucked inside a warm roll made with the pinsa dough. Come by for happy hour, and you’re richly rewarded with two-for-one on wine and beer, reduced prices, and more. The wine list will inspire you to drink—and linger—at lunch (and certainly at dinner). The list is pure passion, full of more bottles than most restaurants, and three bubbles by the glass, grazie. While it’s predominantly Italian, you’ll see Slovenian, French, and Portuguese selections, and more. Engage Legrottaglie with a couple of questions, or maybe not, and he’ll still pour you something unique, and teach you how to dip your ciambelline biscotti into your wine at the end of your meal. This place is so authentically Italian—it makes you feel like you were transported to a quick vacation in Rome’s Trastevere for lunch. It leaves you feeling happy and relaxed, even though it’s like crossing the River Styx as soon as you walk back outside—but it’s definitely worth the journey. This review was based on three visits.